I highly recommend this movie to all yogis and to non-yogis who want to understand what traditional yoga is all about. This documentary came out last year and contains interviews and clips of many of the Indian and western yoga biggies, as well as old shots of Krishnamacharya and Indra Devi. However, I was disappointed that the filmmakers did not mention my teacher, Srivatsa Ramaswami, who studied with Krishnamacharya for over 30 years. There is also some good analysis on the state of yoga in the west. Of course I loved all the scenes in India…FYI, the yogi in padmasana in the opening scene of this video sample is Lara, who was the asana demonstrator in my month-long 2005 intensive at the Krishnamacharya Yoga Mandiram. 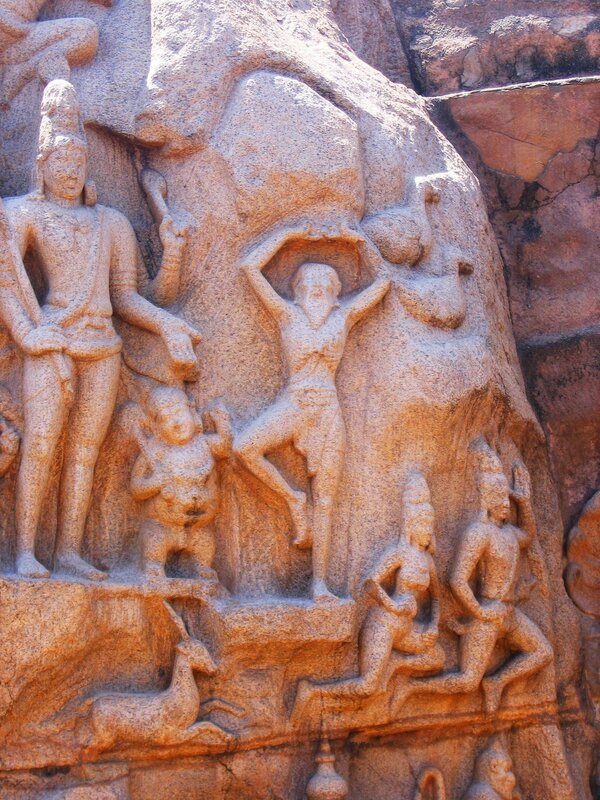 The ancient yogi carving in my photograph above can be seen at Mahabalipuram, a UNESCO World Heritage Site, a bus ride outside of Chennai. Thanks for the comment on my site http://www.chaoticat.com! Your blog is excellent! so full! added to favourites! Thanks! Hey Linda!Great post. I sent India your love, too. Thank you also for the comments on my blog – they are always read and appreciated.One of the women on this course practiced her first yoga, as a 12 year old dancer, with Srivatsa Ramaswamy. She speaks highly of him.PS you want me to spend some money at Anokhi for you? Hee hee. NamasteI like your blog. I´m a practicier of yoga too, from spain.Have a good day!